As per sthalapurana, Srirama stayed here when He came in search of Sita. The Lord offered Tarpana (Jalanjali - Offering of water and Til) and gave moksha to Jatayu here and created Jatayu Theertham. Hence the Kshetra is called TiruPulKuzhi. In the Jatayu Sannadhi opposite the temple, the Lord gives darshan with Jatayu on His lap and performing the last rites. Unable to bear this sight, the Ubhaya Nacchiyars look away in their positions interchanged. Persons not blessed with children tie roasted and subsequently wet seeds around their hips. It is believed that if the seed sprouts then the couple will be blessed with a child. The Thayar is called maragatavalli, since even the roasted seeds sprout due to Her blessings. YadavaPrakasa (Bhagwat Ramanuja's guru and who subsequently became his disciple) taught Porrvapaksha Vedanta to disciples here. Thirumangaialwar - 1115, 2674 (117). Located En Route Kanchipuram -- Vellore Road(NH4 -- National Highway -- Chennai(Madras) -- Bangalore). About 7 Miles from Kanchipuram. 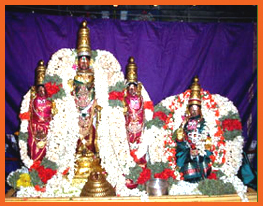 The Perumal of this sthalam is Vijayaraghava Perumal. Moolavar in found in Sitting position facing East direction. This Divyadesam is situated about 7 miles away from Kanchipuram in west direction. 1/2 Kilometer away from Baluchetti Chattiram which is in between Chennai - Vellore highways. By travelling about 50 miles from Chennai, we can reach this sthalam. There is no proper lodging facility.